For places like Las Vegas, trade shows are huge business. Just take a look at the list of upcoming events on the Las Vegas Convention Calendar for a glimpse of what’s coming up in the just the next few months. While Vegas is one of the main locations for conventions, there are dozens of other cities who host hundreds of events annually. Who keeps track of all these trade events globally? 10Times.com is a global data base of trade shows listing events for virtually any industry imaginable. Each year, the 10Times.com publishes a Top 100 listing of shows according to category. 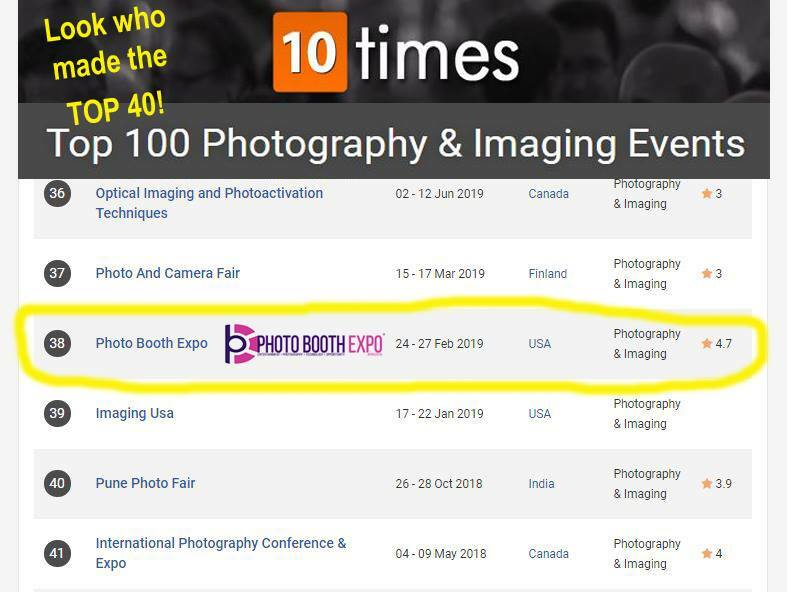 On the current list of the Top 100 events and for Photography and Imaging, Photo Booth Expo is ranked as #38! Considering the size and scope of many of the other shows on this list (SXSW is #26, The Cannes Film Festival is #24), this makes Photo Booth Expo not only The World’s Largest Event for Photo Booth Operators, Manufacturers and Suppliers, but also is also establishes it as one of the top global events for photography and imaging.